Blue Flame Credit Union is a full-service financial institution offering insurance and payment protection products to protect you, your credit, and your assets. Auto insurance will cover a lot, but have you considered what an accident or mechanical failure could really cost you out of pocket? Learn about how GAP Insurance and Mechanical Repair Coverage might be just the vehicle debt protection you need. An unexpected disability, death or even an involuntary period of unemployment can affect your household's income level, making your financial obligations very difficult to meet and significantly impact your family's standard of living. Struggling to make loan payments on a reduced or lost income is a heavy burden that your family should not have to bear, especially when coping with the emotional and physical stress of a disability, death or loss of employment. Blue Flame Credit Union offers MEMBER'S CHOICE™ Borrower Security Debt Protection as a convenient and affordable way to keep your loan repayment on schedule. Disability - In the event of member becoming disabled, the loan payment will be cancelled up to contract maximums during qualified disability period. There are no upfront charges and the cost is added to your loan on a monthly basis. MEMBER'S CHOICE™ Borrower Security Debt Protection will cancel or waive your eligible loan payments. Debt Protection products are available for both new loans and current loans with Blue Flame Credit Union. When applying for a new loan with BFCU you will be offered the option to choose from several Debt Protection packages. Additionally, Debt Protection options are available for existing BFCU loans. Please contact a BFCU loan officerOpens in New Window if you wish to add Debt Protection to any of your loans. Your purchase of Debt Protection is optional and will not affect your application for credit or the terms of any credit agreement required to obtain a loan. You may cancel this protection at any time. Certain eligibility requirements, conditions and exclusions may apply. Not sure if Debt protection coverage is for you? Give Borrower Security Debt Protection a try for 30 days.Opens in New Window During those 30 days, you can cancel your coverage at any time with no penalty. Debt protection products are underwritten by CMFG Life Insurance Company. Blue Flame Credit Union has partnered with TruStage CUNA Mutual InsuranceOpens in New Window, to offer you several life insurance options that provide the coverage you and a price you can afford. With choices like term life, whole life, and annuities, you will be able to find the perfect policy to fit your family’s needs. One of the benefits of BFCU membership is the no cost, $1,000 TruStage Accidental Death and Dismemberment (AD&D) Insurance that pays a cash benefit to you or your loved ones in the event of a covered injury or death due to an accident. No medical exam or health questions are required. Members age 18 and older cannot be turned down. Additional AD&D coverage up to $300,000 is available at affordable rates. 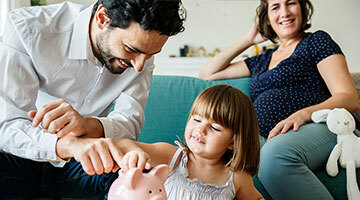 The TruStage CUNA Mututal Insurance ProgramOpens in New Window works with some of the nation’s most trusted insurance companies to provide members of Blue Flame Credit Union with extra savings on AutoOpens in New Window and Home InsuranceOpens in New Window policies. In 2015, credit union policyholders saved an average of $519.52 on their car insurance alone. Additional insurance programs to protect against costly auto repairs or to make up the difference between your Auto InsuranceOpens in New Window and your loan amount are available under Vehicle Protection. TruStage Life and AD&D insurances are issued by CMFG Life Insurance Company. Auto and home insurances are issued by leading insurance companies. The insurance offered is not a deposit and is not federally insured. Blue Flame Credit Union has partnered with AFLACOpens in New Window¹ to provide members with access to products to help supplement the other insurances you already have in place. AFLAC is different from major medical insurance; it's insurance for daily living. Unlike traditional medical insurance, AFLAC pays cash benefits directly to you², when you suffer a covered loss, which can help with lost income, deductibles or co-pays. ¹American Family Life Assurance Company of Columbus underwrites coverage. In New York, American Family Life Assurance Company of New York underwrites coverage. ²Benefits are paid directly to you, unless assigned otherwise.